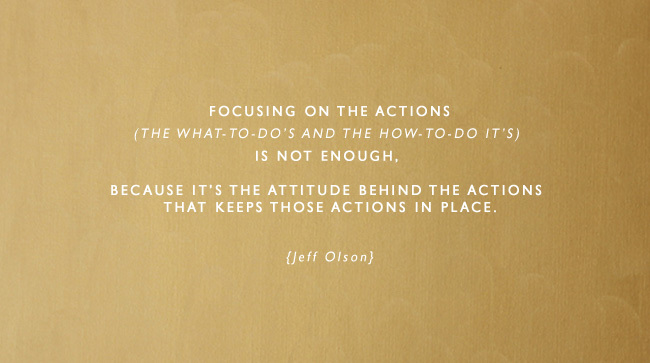 Life With Intention Online registration is now open! You can learn more and sign up here. I’m headed to Alt Summit in Salt Lake City tomorrow to host a podcasting roundtable with Hilary Walker. I have a new Lively Show episode for you! 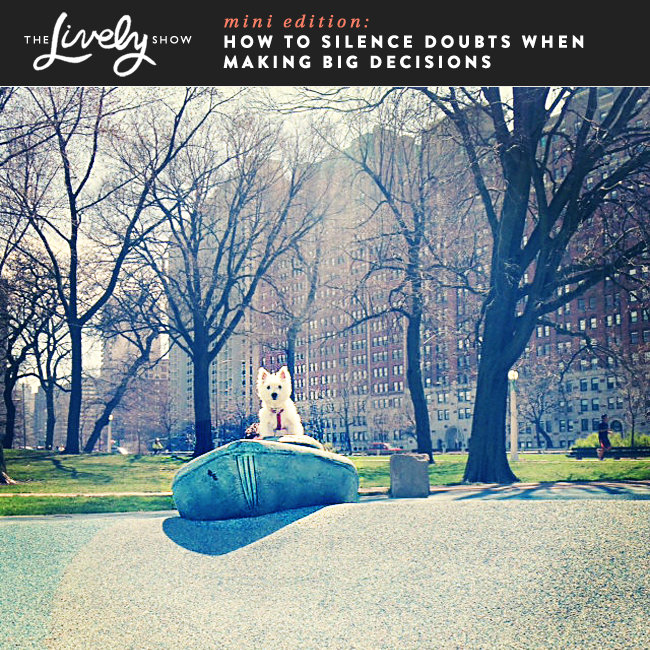 Today I’m answering a listener question about how to silence the doubts when making big decisions. 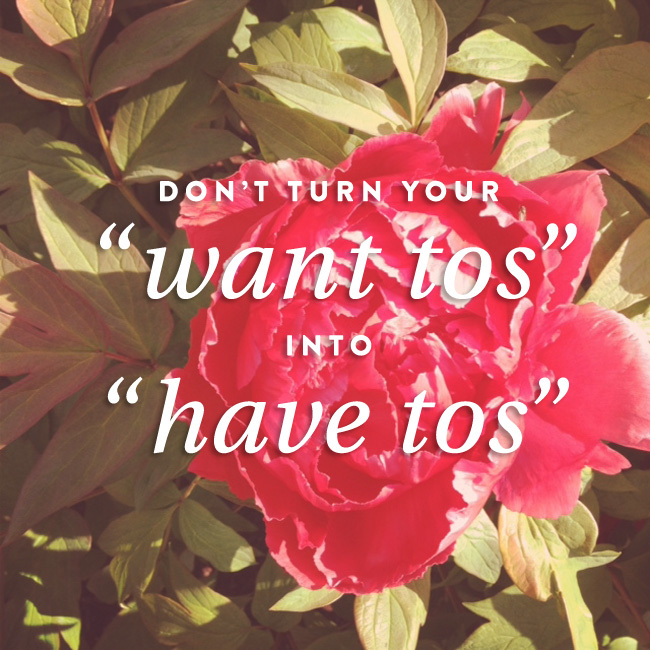 Though we all face disappointment and rejection throughout our lives, “nos” to opportunities we deeply want hit hard. 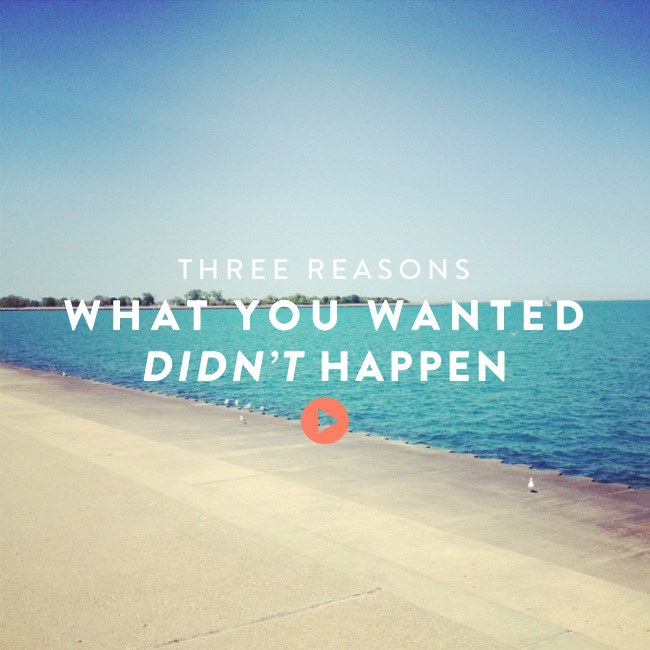 Today I’d like to share three reasons why those “Important Nos” in our lives may happen. As you’ll see, these nos are actually working out for the best… though we may not see how in the present moment. At 6:18pm on December 28th, 2011, I sat on the Orange Line train at Midway waiting to return home after a trip to see my family in Pennsylvania. Due to the snow storm that hit the east coast over Christmas, flights were delayed and my entire trip (with a layover in Minneapolis) lasted about 10 hours. As I sat in the train I had a mini-breakdown. I’ve had this Pinterest picture bookmarked for several months. I knew I wanted to talk about it, but didn’t quite have the message yet. I’ve recently begun to dive into “The Work” of Byron Katie. For those who don’t know Byron Katie, she is a speaker, teacher, and author who travels around the world helping people release themselves from their stressful thoughts. And if you are anything like myself, stressful thoughts are something that need tending to now and again. After reading her book, Loving What Is, I’ve had the chance to apply her simple framework in my own life and in the lives of some of my clients. The results have been pretty powerful. To truly understand this process, I highly recommend reading her book and watching her do The Work with people. 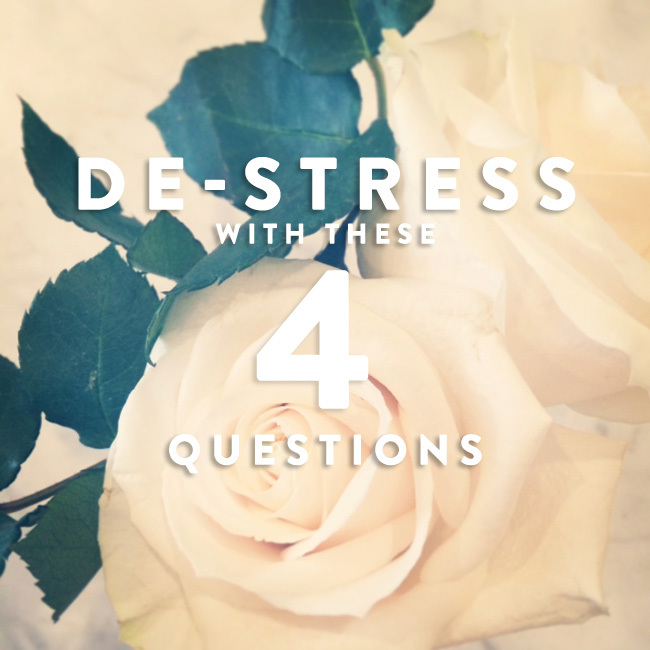 Today, I’d like to walk through Katie’s four simple questions to show how they can be applied to any stressful thoughts you may have now or in the future. Today I’d like to share a story that helps illustrate the difference between motivation and inspiration when taking action in our lives. This is a tale I share in Life with Intention Online and during speaking engagements to help illustrate the difference between these two approaches. 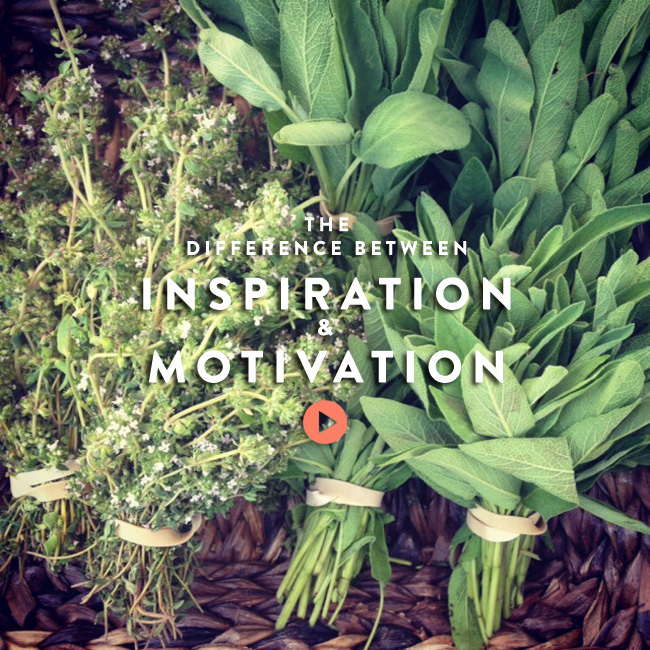 Once you hear the story, you’ll be able to identify your motivation vs. inspiration in your own life. As I pondered what to share with you today that could add value to your life, I realized that I never know exactly what you, you personally, want to hear. So today, I’ve decided to try something new! 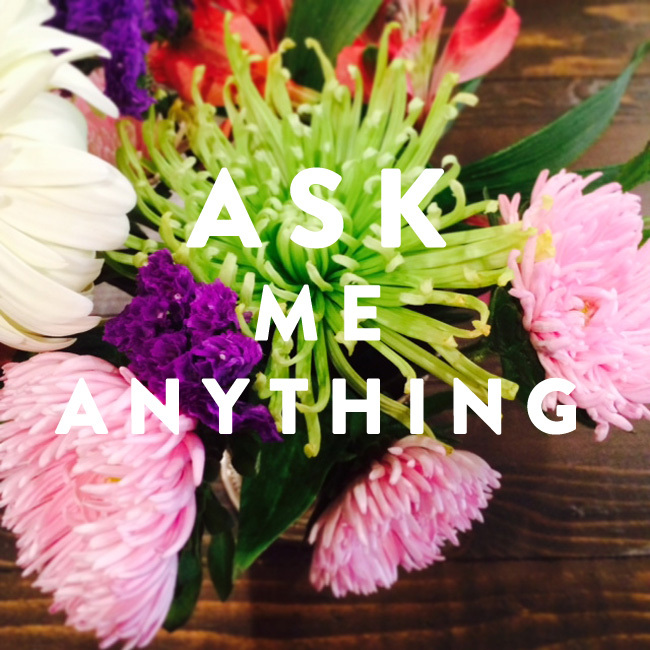 Rather than write a post that I think might be helpful, I would like you to simply email me directly and ask me a question you have! To tell the truth, I have a pretty random desired outcome on my life goals list (yes, though I don’t take goals too seriously, I do have a list that I put some fun things on from time to time): To be free of dental work until I’m 70. I’m not really sure. I just decided that it’s something that might be possible if I’m diligent about brushing and flossing regularly. Having this vision now inspires me to be more proactive about flossing than I might otherwise be if I didn’t have this super specific outcome in mind. By committing to the simple act of flossing regularly, I know I’m likely to strengthen my dental health compared to flossing infrequently or not at all. Though it is easy to see the connection between physical habits and physical strengths in our lives – like flossing our teeth to keep them healthy or lifting weights for muscle tone – the same is true for other less tangible strengths, as well. A few months ago, Jeff Goins mentioned that gratitude is a muscle and I am beginning to believe that far more than just gratitude can be strengthened in our lives if we devote ourselves to consistently exercising the traits we want to strengthen. This, I believe, is the biggest divide between those who want to improve specific traits “one day” and those who feel like they are making substantial progress in their lives. It’s the difference between talking about flossing and actually doing it. Consistent action must be taken. The good news is that the intangible muscles like creativity, spirituality, communication, focus, patience, gratitude, and presence can be strengthened without a ton of extra work. Common daily activities can be altered to accommodate “strength training” and other rituals can take as little as thirty seconds. But the biggest key is that these exercises must be done regularly – not just read about, tried a few times, and abandoned. Of course, we don’t have to do the same exercise or ritual over and over again forever. We can change things up. We can even do “interval training,” if you will. Building these muscles can be a fun experiment with different methods. As you will notice, there is a fair amount of cross training between these exercises. Some of them build multiple strengths at the same time. But remember, the important thing is not to do several of these actions and then fade away. Pick a select few and incorporate them into your life consistently to reap the rewards. Perhaps you could choose to focus on adding one new mini habit or ritual every month. By a year from now, you will have 12 new mini habits incorporated into your life. Your intangible strengths would be much stronger with this slow and steady approach than had you tried 12 habits all at once and abandoned them after a week or two. Which muscles are you going to strengthen? Create a gratitude journal. documenting five things you are grateful for everyday. What was the best part of your day? Ask this to your partner every evening before bed to recall a moment you are grateful for each evening. Reserve email to specific times. Not always easy to do, but definitely requires patience. Enjoy your time in traffic. How you could add more patience to your commute is up to you and your unique situation, but the rewards could be profound. Wait while the browser loads. I know the urge to open a new tab and look at something else while a webpage loads can feel like a compulsive itch. Try to sit with that feeling rather than act on it. Meditate. Even if it’s for five minutes a day. The Calm app is great for this. Yoga. This is an obvious one, but it’s worth sharing none the less. Qigong. This is my newest habit I’ve incorporated into my routine (and the one I’m enjoying the most). Right now I enjoy this simple seven minute video at some point in the day (usually in the morning). Read spiritual books. This is a great way to expose yourself regularly to spirituality, but be sure to weave the teachings into your daily life for best results. Join a spiritual group. A church, temple, center, or study group can help enhance your awareness, but be sure to do solo spiritual activities too to make sure the concepts are applied in your life outside the group as well. Pray or chant. Depending on your spirituality, this may be a good place to start. Journal. In my own life I’ve found the most powerful way to connect with my intuition is to write my gut and ask it questions about things I’m struggling with. This inquisitive journaling allows me to access wisdom I don’t even realize I have if I simply go through my day thinking whatever thoughts happen to pop into my head (usually from my ego). Journal or blog. If your brand of creativity is writing, consider creating a journal to capture your poems, stories, or ideas. Draw or paint. If your version of creativity involves illustration or painting, find a way to bring that into your day, if only for a few minutes before you get ready in the morning or before you go to bed. Practice your art. Whatever version of creativity you’d like to strengthen, find a way to weave it into your life through a mini ritual that you will look forward to. Single task. One browser tab at a time. Eat without distractions. Try driving without the radio or podcasts on for a bit. Use a timer. This is a great new habit that has helped me focus immensely during my workday. I now try to batch my days into 90 minute chunks (yours can be anywhere from 20-90 minutes) with 30 minute breaks in between. Once I set the timer and I know I’m going to get a substantial break very soon, I find it much easier to stick to one task at a time. The Pomodoro Technique might also be helpful. Meditation, yoga, or qigong. 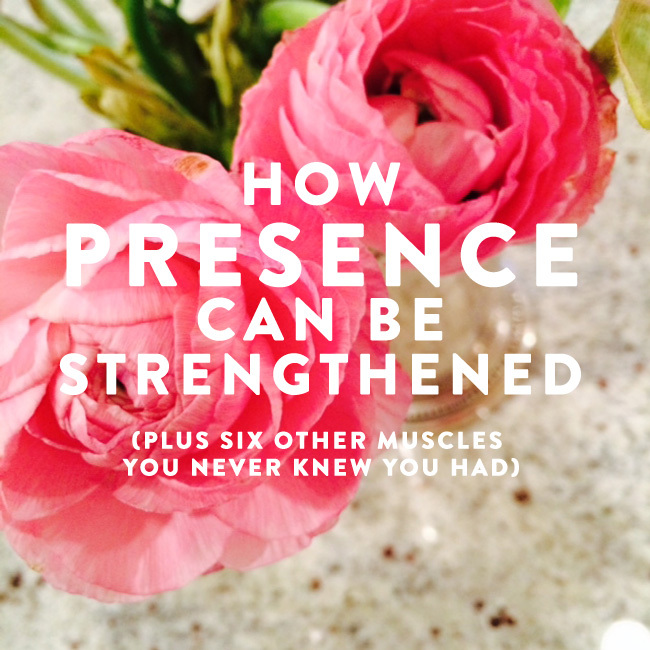 Pretty much anything that helps strengthen presence in your life can also strengthen your focus. Seven years ago, I stumbled upon my purpose in life: to help people reveal their fullest potential. Since then, I have literally designed my career around this mission. It has been a long and winding road. One filled with challenges and anxiety attacks – as well as huge breaks and celebrations. In talking to people on the subject of purpose, I get the feeling that many people might be confused as to what purpose in life really looks like. So today, I’d like to share a bit about my journey with the hope that it will dispel a few myths about how a purpose led life takes shape. This is the “un-Photoshopped” picture of purpose, if you will. 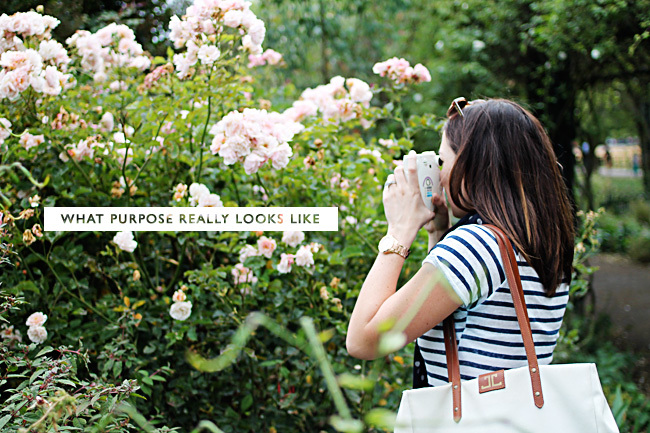 Though many people often assume that you must “find” your purpose, I did not. I actually stumbled upon it by accident during the most difficult time in my life. As a college junior I was binge eating candy bars three at a time and going to counseling for personal matters from my childhood. In three months I gained 20 pounds, lost all of my self-esteem, had a constant negative loop of self-talk going on in my head, and desperately wished Dr. Spock could beam me into Perfect Jess. I desperately wanted to abandon everything about myself and just Be Better. Be Perfect. Not surprisingly, that didn’t happen. Instead, day by day, I had to pick myself up from the pit of self-pity and negativity I dug for myself. This is where The Seven Habits came into my life. I picked up a dusty copy of the teen version while home from college and found a foundation that I could build my actions and values around. While in this self-discovery phase, I also happened upon a passage in The Art of Possibility that described how Michelangelo said it was easy to create the statue of David because he saw the figure within the stone and simply removed what was not David. This passage was a huge paradigm shift for me: I didn’t need to seek my completion, happiness, and potential by adding to my life, I needed to subtract all the not-so-great habits and things that blocked my potential from unfolding. That simple a-ha moment hit me so squarely in my heart that I knew it was the lesson I was not only supposed to learn in my own life, but was one I was meant to share with others as well. My mess became my message. With this purpose in place, I set about learning everything I could on the subject of success, achievement, intention, and fulfillment. For the past seven years I’ve devoted my reading and my learning to this topic. That said, I didn’t know exactly how to bring this mission and the principles I was uncovering to the world. I debated back and forth about getting a job after graduation. At the time (2007), I was convinced that I was going need a TV show to help people. You know, like Oprah and Martha. After a little research, I realized that Martha wrote a book called Entertaining that sold so well that it launched her career as we know it today. With this in mind, I decided to write a book. I worked on it in my dorm room and in the evenings during my internship at Macy’s in New York. As I neared graduation, I decided to take my part-time jewelry business full-time in order to pay the bills and continue working on the book proposal. I moved to a tiny, not-so-nice studio apartment in Chicago and grew my jewelry company to pay the bills. I started with $700 in the bank from college jewelry sales and grew the company to over six figures in three years. Though this might sound like it was effortless, please know: I’m just sparing all the the awesome and scary details to keep this story going. You can read the whole story of this phase in my life here. Eventually, I decided to do what I could, right where I was. About 14 months into the business, I realized I was climbing the wall of entrepreneurship and needed to start pursuing that book proposal. I hated the idea of being a super-successful jewelry company owner that never pursued the real reason for being self-employed in the first place: to write a book, get a TV show, and help people! At the time, I was learning about blogs and decided to continue my proposal on a blog, rather than a blank Word Doc. Due to a completely unrelated giveaway I did on a major blog, a trickle of people started to click from the jewelry site over to the new blog. Seeing readers respond to my posts, I suddenly realized I didn’t need a TV show or a book to help people. I could simply help people one day at a time, writing online to whoever would listen! Blogging changed everything. I dropped the need to write a book and poured my heart and soul into the blog. 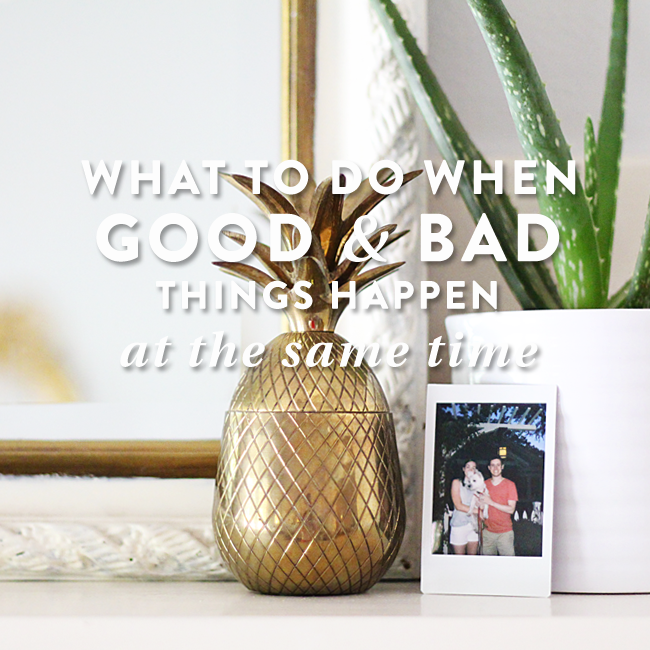 I spent half of my day focusing on blogging related content and the other half on Jess LC. My day job benefitted my purpose. Though many didn’t understand that Jess LC was never my ultimate goal – it was a very pretty, sometimes risky day job – that day job happened to help me transition into my purpose as a career. This was huge. I know a lot of people think that I started off with my purpose full-time right out of college, but really, it was Jess LC as a day-job that allowed my purpose-based career to take place gradually over the last five years of blogging. People started asking me for help… and paying me! The first stream of income based on my purpose (beyond a few hundred dollars here and there for blog ads) was business consulting. I realized early on in blogging, during the peak of the recession, that people craved entrepreneurship online as a way to live intentionally. So what started as blog posts on the topic of business, eventually turned into one-on-one consulting sessions. Over time, I added traveling workshops, an ebook, and the Workshop At Home. The revenue I was making from the business services eventually equalled what I was making from Jess LC. At that point, I was able to close the successful accessory line and focus on my purpose full-time. The whole transition took five years altogether, including four years of blogging. Over time, how I fulfilled my purpose shifted. As I closed Jess LC, I was so excited to help people full-time that I got distracted from my ultimate purpose- to help people find a better way to live a better life. So there I was in November of 2012, full-time helping business owners with strategy, marketing, and branding. It was nice, but not quite the fulfilling my complete intention. A single email from a reader asking me to help her with her life helped me reconnect with the a-ha moment that started this whole journey. I then expanded my workshops and one-on-one offerings to include life with intention options and straddled both business and life for much of the past 14 months. Finally, I asked my gut what to do. Last spring, as I stood in line for the bathroom in an Austin restaurant, I asked my gut what I should do next. I expected to hear something like “more workshops.” But instead, I heard a different, unexpected response. And while I have been working on fulfilling that decree over the past year, I found it impossible to focus while juggling everything on my plate. What once seemed like a really fun and super awesome career in doing everything that I liked (business consulting, blogging, workshops, writing, speaking, interior decorating, and re-branding a hotel) turned into a huge distraction from my gut’s simple direction. I stopped doing some purpose-based stuff do do other purpose-based stuff. To get serious about following my gut and evolving into what I am meant to do at this point in time, I dropped the business consulting. But really, it is the truest expression of my purpose to date. I am so excited to see what 2014 brings in this area. It has been a long and winding road with many twists and turns waiting to reveal themselves in the years to come. As you can see, this whole purposeful journey has been fuzzy, unexpected, sometimes clear, risky, and never-ending. There is no “a-ha moment followed by a permanent and clear vision of what you are meant to do for the next 60 years.” Purpose is not a straight path. You simply must do the best you can today to help the people in your life through your talents, ability, and love. Keep going. Keep growing. Keep following your gut. The rest will be shown to you. Though we are now almost a week into the new year, it seems like today is the somewhat “official” start of our 2014 daily routines. With this in mind, I thought it might be a good idea to address an overlooked aspect of habit changes: making sure they are balanced. 1) We decide to eliminate an old habit – such as excess TV watching, smoking, fast food, or even toxic relationships. 2) We decide to implement a new habit – such as creating a private victory routine, working out on Tuesday nights, or making homemade lunches more often. Sometimes making these shifts is relatively easily, and sometimes it can be quite challenging. I believe that habit shifts are more difficult to accomplish if they are not tied to a true intention. Or, if they have a guiding intention, they can still cause trouble if they are imbalanced. 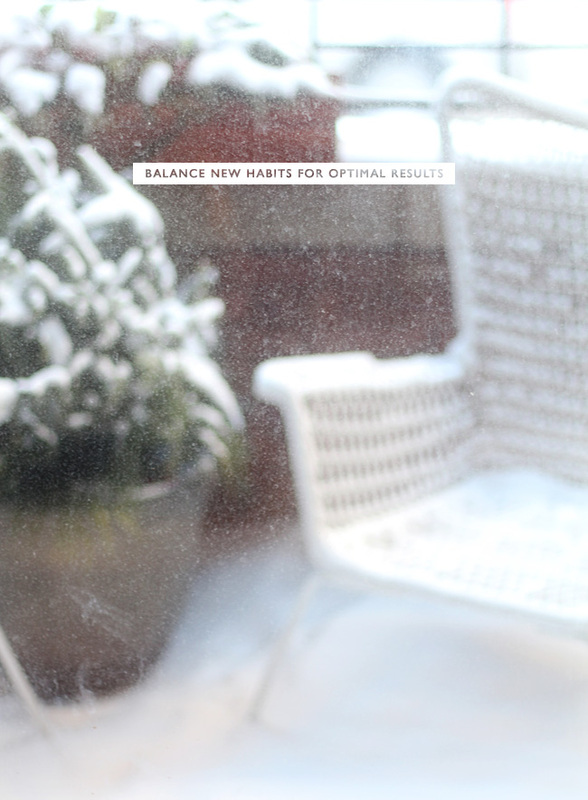 What is a balanced habit? A balanced habit involves both what you want to include and what you want to remove. When we don’t take the time to consider both sides of the habit equation we can often find ourselves mired in frustration and inaction. We may know what we want to add to our lives, but we can be unaware of what we need to subtract from our lives in order to free up time or space for the new habit. The subtraction issue is common particularly when it comes to anything that involves time. Getting up earlier for workouts, mediation, or private victories, is often difficult not because we don’t want to, but because we never stop to consider that it may require us to shift our evening habits. We might have to stop watching that last episode before bed in order to get up earlier. That habit shift might be the one we really need to pay attention to first, in order to fulfill our early morning vision. Or, perhaps we want to spend more time with our partners in the evening. We must assess our life and find where that time will no longer be spent. Spending more time with our loved ones requires us to shift our time spent on another priority first. From all of the clients that I’ve worked with, I have rarely (actually, never) found a case where someone wanted to add a habit to their lives and did not have an available pocket of time for that habit. The challenge is to recognize that the present time slot is not being used to your best use, and to overcome any mental resistance to making that shift. It is also imperative to consider a replacement habit if you are seeking to remove an old habit. For example, I used to eat Trader Joe’s Reduced Guilt Mac and Cheese everyday for lunch for about a year and a half. I loved everything about the little light blue boxes of joy. They were easy to make, tasty, and quick to eat. However, my consciousness towards this this habit slowly shifted. Though my ego was quite happy with this lunch routine, the deeper part of me knew that eating the same frozen meal for the next 20 years would not support my overall wellbeing. As my intuitive resistance grew towards the mac and cheese habit, I never took the time to discover a suitable meal alternative. I didn’t want to waste energy on finding a more nutritious and equally fast and tasty option. So I stopped buying mac and cheese, but never knew what when the clock struck twelve. Let me tell you, as someone who doesn’t want to have to make a decision about food at lunchtime, I was going crazy scrounging up something to eat everyday. Eventually, I realized that I needed to spend some time figuring out what I did want to eat in order to escape the frustrating habit shift. The pain of not having a replacement meal became much greater than the loss of my beloved mac and cheese. It took a bit of experimentation, but I’ve finally found my lunch alternative: homemade tofu and kale lasagna. Mr. Lively bakes me a pan of it every few weeks that I split it into pieces and freeze. Though lacking a replacement habit is a more uncommon habit imbalance, we must recognize that killing an old habit requires the development of a new one, consciously chosen or not. What are you removing and what are you including? You deserve to find the fulfillment and joy that comes with an intention-based life – no more shoulds, shame, or “one day” thinking required. Work with me one-on-one to find a balanced way to live a better life. As you know, I’m not a fan of New Year’s Resolutions. And from what I’ve gathered from conversations with friends and other posts on the internet lately, it seems that resolutions, with a meager 8% success rate, aren’t quite as popular as they once were. While this is great news, it doesn’t mean that we cannot still create real and lasting change (for the better) at the start of a new year – or any other time for that matter. 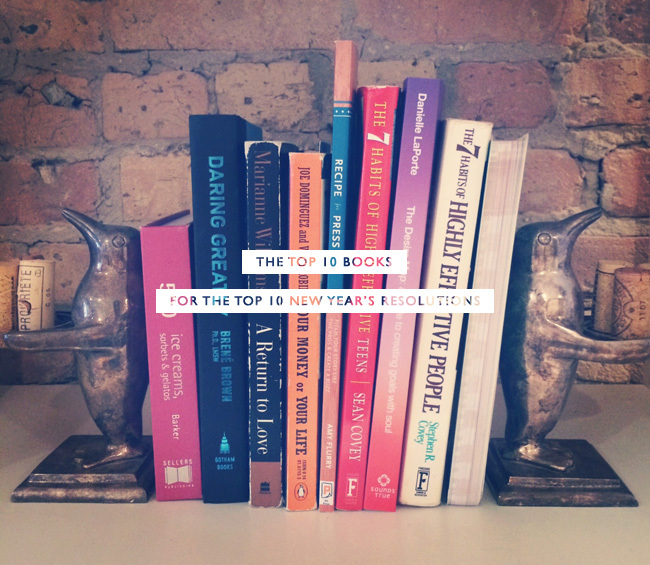 Though we may not be making any “grand proclamations,” I think it might still be helpful to share a few books that I find powerful to help address the most popular new year’s resolutions for 2014. Because even if we might not be making “resolutions,” these areas are important and benefit our overall wellbeing. As you may remember, I spent nine years of my life thinking about food and my body more than anything else. I ate too little. I ate too much. I was all over the place, letting my ego run the show… until I read this book. Please don’t be turned off by the mention of God in the title, it’s not a religious book. But it will create a few secular “Come to Jesus” moments. This book was my first step to weight and body image freedom and I cannot recommend it highly enough for anyone who struggles with this all consuming issue. Though I have recently shared a complete review of this book, I will quickly share that this book is particularly helpful if you are looking to find a system of planning and organization for work and life. It’s not geared specifically towards clutter, but it will give you some tools and processes to put in place regarding to-do lists, project planning, and keeping track of everything in your life. This book has been instrumental in my own life in the past year to get more inspired to spend less and save more. Hearing the Williams personal story of reducing their ~$40,000 in debt in 23 months – on average incomes – made me deeply consider what I really want to do with my finances. This isn’t a hands-on “how-to” book for debt reduction and budgeting, I believe it’s the precursor: it’s the book that makes you want to get more serious about finance and saving. Meanwhile, the Words of Williams blog is a great resource for the tactics and nitty gritty details of making a budget happen. More than anything, I’ve come to believe that being present is the key to enjoying life to the fullest. And the book that has helped me in that area more than any other is The Power of Now. I found that it got particularly helpful towards the middle of the book. Implementing Mr. Tolle’s suggestions in my life has created more moments of presence and awareness – which in turn lead to joy. This isn’t a book about exercise. It is the book that will explain why it may have been difficult to maintain a healthy fitness schedule in the first place – and what you can do about it going forward. If you want to make any change in your life, this book is the one to start with. After reading The Slight Edge, you simply apply these straightforward and powerful principles to the details of the habit you wish to make. Chances are, there may be an exciting new habit or skill lurking in the back of your mind that you wish to attempt. But for some reason or another (time, fear, money, public opinion, Homeland) you haven’t done anything about it… yet. This book reeks of soul-bearing truth and can be the wake up call that gets you going. This one isn’t actually a book, it’s a post by Leo Baubuta of Zen Habits sharing his own tips on quitting. Stopping his smoking habit once and for all actually kicked off his journey to living a zen life. I recommend diving into Leo’s other books, interviews, and posts to get a fuller sense of what helped him kick the smoking — and kick start so many other positive changes along the way. This book is a great way to understand the elements of purpose. Once these concepts are understood, it becomes easier to teach and share the principles with those who seek more meaning in their lives. I’m not particularly familiar with the genre of dating books out there, I found this one to be pretty helpful and fun to read. Regardless of whether you are single, dating, or married, this book is a fun read that has a fresh take on a lot of universal principles. What can I say? You didn’t expect me to leave out my favorite book of all time, did you? Yes, I’m proud to list The Seven Habits as a foundation for any of these resolutions, particularly this one about more family time. When it comes to finding balance in life in all areas, this book (particularly habits 2 and 3) will provide the road map. Though the content can seem dense at times, it is worth its weight in gold when applied consistently. Take some time with this one. A month per habit is a good way to approach this valuable material. Reading books is useless unless the concepts are applied consistently. So go forth and read and then do!